While “we’ll leave the light on for you” has been used as the advertising catch phrase for one motel chain, leaving a light or a candle burning in the window has a long tradition. My mother told me that the idea of placing a candle in the window to light the way for a loved one to return home came from World War II. Both her brothers served in that war and came home. She later lit a candle in a window of our house for her beloved brother, Teddy, when he went to fight in the Korean War. He was killed there in combat in 1951. It turns out that this tradition pre-dates my mother’s knowledge. The cited HubPages quote above by Chuck Nugent celebrates a story of a candle still burning today for a World War I soldier. After more research, a later post by him tells us that the candle was actually lit for a son who went on a journey in 1927 and died in a plane crash. Though the mother who placed it there is long gone, her devotion is still honored. The candle remains, lit night and day, in a home in Canandaigua, NY, a landmark noted by all who visit there. Colonial Williamsburg has had candles in the window at Christmas since 1934 and cites their architect as saying candles were lit in Boston windows at Christmas since 1896. This made me think of candles in the tower of the Old North Church, “one if by land and two if by sea,” that launched Paul Revere’s ride. Certainly, I have subsequently found other references to candles in windows for Civil War soldiers and in colonial times to light the way home for loved ones. Ellie Rodriquez said, “The light is what guides you home…warmth is what keeps you there.” A candle easily can stand as a symbol of home, not just for its light, but because its glow seems as warm as the love that waits there for our return. Whether that metaphorical candle has or has not been lit for us, whether that place is still owned by our family, or we never go there anymore, home always occupies a place in our memory. Over time, I think, home acquires perspective. We understand more of what it meant to us as we reflect on our best and even our worst remembrances. In Polish tradition, “Gromnica” candles are taken to church on February 2nd or Candlemas, the day Mary was blessed in the synagogue after the birth of Christ. After being consecrated, this candle would be placed in windows during thunderstorms to protect the family, lit in the spring to ward off wolves, and placed in the hands of the dying to attest to their faithfulness and light their way home to heaven. My hope for you this year is that memories will bring you light, warmth of recollection, and remembrances of love to help you find perspective on the past and make sense of the future. Go home. It’s ok. In memory, we can always find the way and the lights are always on. This entry was posted in Writings by Wordsmiths and Others and tagged Boston, candles, Candles at Christmas, candles in the window, Candles in Williamsburg, Christmas, coming home, Finding the way home, Finding your way home, Home, lighting candles, Old North Church, tradition, World War I, World War II. Bookmark the permalink. Thanks for the encouraging words, Wendy! I keep electric candles in my window all year long and light them when I am having guests. I thought it was an old Irish tradition and loved getting more information about the tradition from your post. The part about home reminded me of a Robert Frost poem, “Death of the Hired Man” Home is the place they have to take you when there is nowhere else to go. I love Frost’s poetry and have visited his homesteads in New Hampshire. But the man was not so nice as are many writers, I’ve found. I always have electric candles in my windows at Christmas. 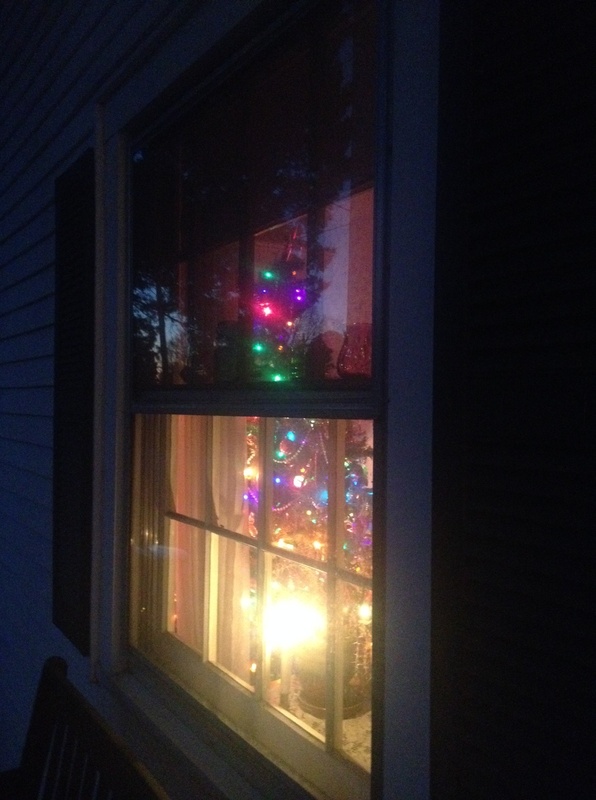 On this post the picture of the very bright candle in the window and a Christmas tree lit in the background is our house. (The house itself is in my “Little Resurrections” post. We had a Federalist style house in Syracuse and now we live in a 100+year old Federalist house converted to Greek Revival. (Columned porch added quite a long time ago.) But both houses were perfect for the candles in the windows. I think I fell in love with the idea at Cape Cod – so many lit like that at Christmas there it seemed kind of magical. How nice that you light the way for your guests! Yes, I also like that poem…and home being where one finds welcome and a place to be taken in no matter what! I haven’t formally studied Frost so didn’t know he wasn’t so nice. I did do a post on “The Road Not Taken,” which I’ve always loved. I was actually planning to do a second one with a different interpretation at some point, but haven’t. We have had more warmth during the day today and yesterday…but have a frost warning again for tonight…so lugging the porch plants back once more! Last year I did two planters with bleeding heart vine (Lovely!) and kept them alive in and out on and off since spring began.